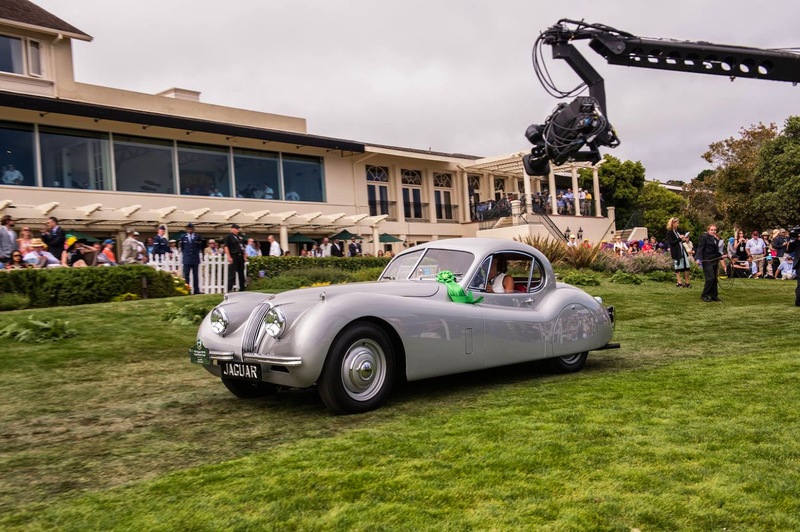 History was again made at Pebble Beach this year, with a 1951 Jaguar winning the post war car class! The XK120 Fixed Head Coupe is owned by London-based public relations guru, Stuart Dyble, who runs the highly-rated international PR consultancy, Influence Group. The car’s restoration, by JD Classics, was still being finished as the car was loaded onto a pallet for the flight to San Francisco! Not only was Dyble thrilled with the result of his and JD’s efforts to bring the car to Concours standard, but the car itself is yet another notable Jaguar, unearthed by Jaguar Magazine publisher and editor, Les Hughes. Les, who is based in Brisbane, Queensland first heard of the car in 2004 when it was acquired by South Australian collector Percy Dixon. After rigorous research by Les, the car’s incredible history emerged. It is LHD Chassis #2, created as a Fixed Head Coupe in 1951 from its beginning as a pre-production convertible. 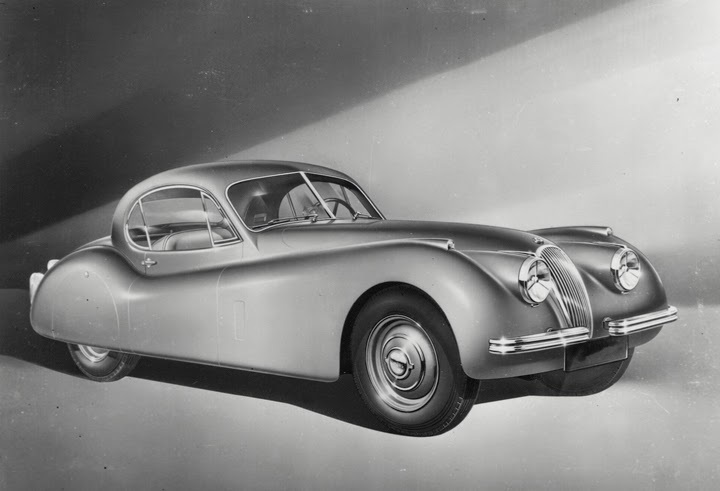 Sir William Lyons had been quick to recognize the need for a coupe version of the sports car, and in just over 18 months after the launch of the convertible Lyons had his team of engineers design and build the closed coupe. To get things moving the engineers used the existing body of the very first XK120 roadster! The car which won its class at Pebble Beach was the star of the Geneva Salon in 1951, then became the promo car, featuring in brochures, press advertisements, road tests and car shows. Here's one of the early promotional photos. At the end of its promo work LHD #2 was sold to a US military officer in late 1951. He was stationed in Frankfurt, and after the car was sent back to Browns Lane, it was shipped to California where the West Coast distributor Charles Hornburg again used it for publicity, before it went to its new owner who had returned from duty in Germany. It next turned up on a used car lot on Hollywood Boulevard in 1957, painted maroon. A Canadian bought it, drove it to the New England-Canadian border, but could not import it into Canada, because he didn't have the right documentation. He sold it right there and then! Next time it was seen was back on the West Coast in the late 70s when it was sold twice, and finally it languished outside, under a tree, until acquired by Adelaide's Percy Dixon in late 1993. Percy began restoration, but it remained unfinished. Percy passed away in October 2013 and the car was sold to JD Classics. Les Hughes was asked by JD to inspect and photograph the car before it was shipped to the United Kingdom. JD subsequently agreed to sell the car to Stuart Dyble, providing the restoration could be finished in time to enter the car at Pebble Beach. As they say, the rest is history-making! 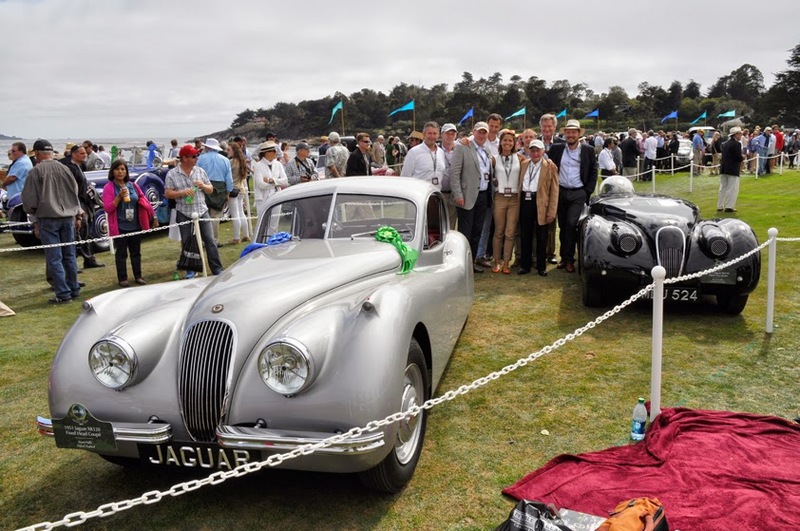 Parked on the 18th fairway at Pebble Beach, alongside another famous XK120 (MDU-524), the 120mph land speed record car driven at Jabbeke, Belgium in 1953 by Norman Dewis, Stuart Dyble and his support team celebrated with Norman, who at 93 is as sprightly as ever. With both Jaguars winning their respective classes, this injects more ‘new life’ into the Pebble Beach Concours d’Elegance. Chairman Sandra Button forecasts this may well open the door for more post-war cars to become winners. In fact in 2014 the 64-year-old-Concours was again a special moment in time, as never before have 20 of the existing 28 Ferrari TR250's been together. Never have 16 of the 17 running, and 19 remaining, Ruxtons (of 99 built) been together before, or the surviving six cars and the winning Mercedes from the 1914 French Grand Prix (the 100th anniversary of the last pre-WW1 Grands Prix) together with the actual winners trophy present! Or one of each of the important Tatra streamliners. 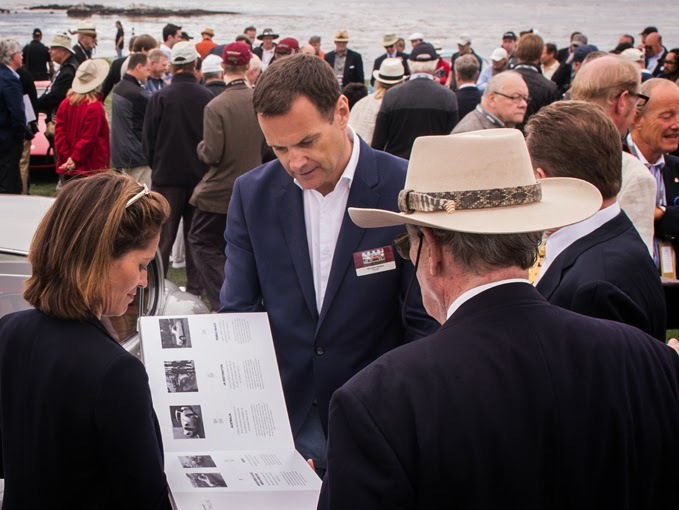 All on the lawn at Pebble Beach this year. Yes, it was another automotive spectacular in Monterey! POSTSCRIPT: Stuart Dyble is a classic case of “Seduced by Jaguar”. After a number of senior roles at Ford Motor Company, he was appointed head of public relations for the luxury car division of Ford, the Premier Automotive Group. After that enterprise finished, he became head of public relations for Jaguar Cars, and by that time he was thoroughly under Jaguar’s spell. No surprise that he has acquired a Concours-winning Jaguar. He’s hooked, like most of us who’ve spent a good part of our lives working with the Coventry Cats! Future of Falcon? We're On The Money!